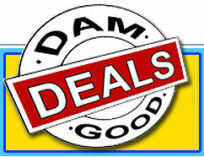 Welcome, this is our very first auction on Dam Good Deals. If you are registered on midlandauctions.ca your username and password should work here as well. If your new please register to bid, it’s free to register, we do not have any buyers premium if you pay by INTERAC or CASH and we have pickup on Friday and Saturday so it’s easy for everyone. ** We are only available for pickup the Friday and Saturday directly AFTER an auction closes, if no auction closed this past Wednesday we will not have any pickup. If you paid for your items online and could not pickup during the pickup hours directly after the auction closed you will need to wait till the Friday or Saturday after the next auction to pick them up. Once we have auctions running every week we will have pickups every week. Invoices are generated a few hours after the auction closes. If you are bidding on items this week please check your INVOICE page the next day to confirm the items you won. Items will be moved from your bids and status page to your invoice page. Please do not rely on email to tell you if you won or were outbid. Emails often get stopped or filed as spam/trash/bulk so they are unreliable. Please do not be late paying for your items. We never want to charge the late fees as we want all items to be paid for on time but… if you feel the need to be late please be aware that a $10.00 PER LOT late fee will be added to your invoice! NO EXCEPTIONS! If you can not make it in on time for whatever reason you can pay online with interac email money transfer or request that we send you a paypal invoice to pay online with credit card. Please do this BEFORE we close on Saturday. If you pay for your items on time but can not pick them up we will store smaller items for you for 1 additional week free. Anything that takes up more then 1sq foot will be billed a 2.00/sq foot per week storage fee. At 60 days we will consider your items abandoned and either resell them, donate them or dispose of them and invoice you the costs involved. At this time we are not taking any consignments from the general public please visit www.damgooddeals.com if you wish to consign single items. We can assist you with full estates in the Simcoe County area, we also purchase complete and partial estates and if you have overstock and wish to liquidate it we can assist you with that as well.